Sadly the Military Outreach Ministry (MOM’s) warehouse suddenly shut down after 18 years of distribution of donations to the military at Camp Pendleton. 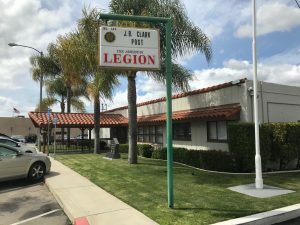 As a result, Aux 149 member Irene Clingman contacted Camp Pendleton Public Affairs and the Chaplain’s offices seeking information on other agencies that were serving families at Camp Pendleton. She was provided information on several agencies but we have decided to join a partnership with Helping Hands Worldwide who has been in service since 1997. Along with 250 dedicated volunteers, they were able to serve 46,000 recipients in 2016! Sita Helms Executive Director, and her volunteer staff distribute donations at Camp Pendleton south on the 1st, 3rd, and 5th Tuesday’s of each month. North Camp Pendleton distributions are on the 2nd and 4th Tuesday’s of each month. Where MOM’s held distributions on the 3rd Saturday of each month, you can see that military families have more opportunities to receive food and other items many more times each month. Up to 5,000 military families depend on the mobile food pantry and with their three refrigerated trucks, in kind donations are picked up daily. The Helping Hand organization is able to supply 30,000 pounds of fresh nutritious food and other donations such as clothing, baby items, hygiene items, etc. each month. Many partnerships have formed with Helping Hand such as Trader Joe’s, Albertson’s, Walmart, Sprouts, Egg Ranch, Growers Direct, Coastal Roots Farms, and Encinitas CA Organic Produce in an effort to supply fresh vegetables, meat, organic vegetables, etc. The egg ranch supplies 900 dozen eggs every two weeks. In addition, some retailers include Sleep Number stores, Laura’s house, and a pet food bank. They also partner with schools, Rotary, Senior organizations, many churches, VFW and Auxiliary of Dana Point just to name a few. Military members attending school at Saddleback College are also recipients of Helping Hand. Because they have partnerships for fresh meat, vegetables, and fruit, canned vegetables or fruit are not requested donations. However, pasta, pasta sauce, long grain rice, canned chicken or tuna, peanut butter, non-sugar cereal, condiments, coffee, and tea are greatly appreciated. Hygiene items, diapers, baby items and gently used or new clothing, shoes, etc. are badly needed. Target, Walmart, Trader Joe’s gift cards in the amount of $10 – $25 are requested but no VISA cards. Gas cards and/or cash is also appreciated. Household items are also needed. 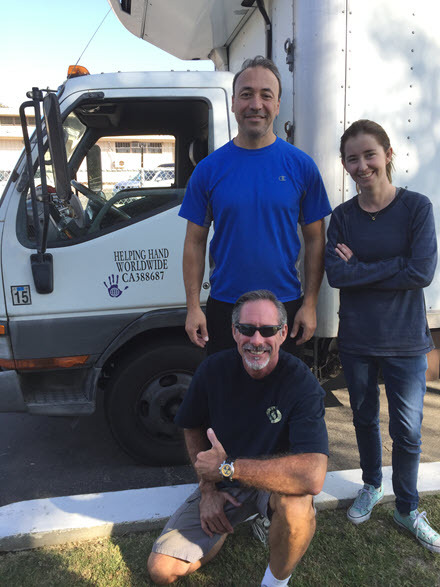 Pictured are volunteers from Helping Hand Worldwide: Sherwin and Hailey back row, Steve Wood in front.